The 60 teens and 11 coaches representing JCC MetroWest came away with more than medals. The competition — which brings together more than 1,000 athletes from across the United States — was held Aug. 1-6 in Richmond, Va., and in Baltimore, Aug. 8-13. Forty athletes participated in the Richmond games in baseball, boys’ basketball, girls’ soccer, swimming, and tennis. Opening ceremonies were held at the University of Richmond, where each delegation marched in to an enthusiastic welcome from the crowd. A video was shown to honor the memories of the 11 Israeli athletes murdered by terrorists at the 1972 Olympic Games in Munich. The MetroWest delegation earned one of the highest medal counts at the Richmond event. 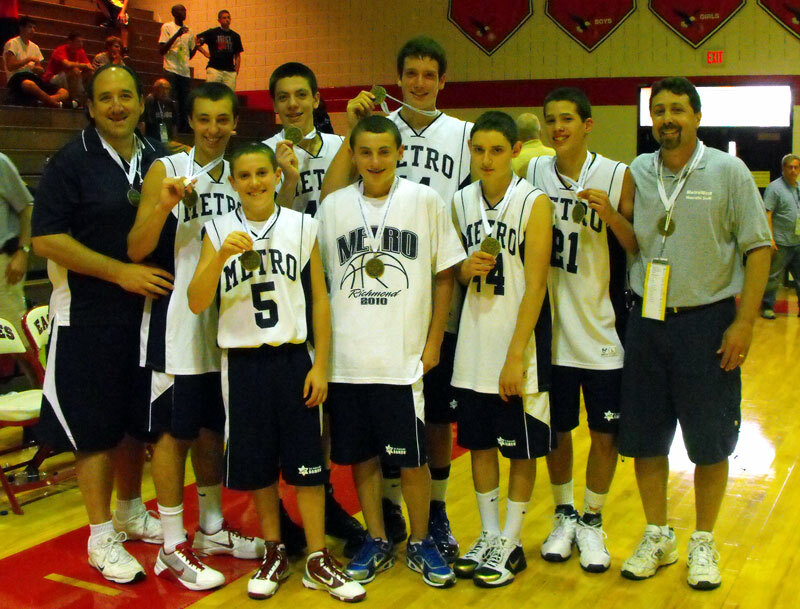 The 14 and under boys’ basketball team returned home with the gold medal. The 16 and under baseball team won bronze, and Andrew Nolff earned a bronze medal in tennis. In addition, the swim teams won 24 gold, 15 silver, and 11 bronze medals. The basketball team ground out victories in a 13-team field that included squads from Detroit, Boston, Philadelphia, and Orlando. The championship game was played Aug. 5 between MetroWest and Philadelphia. MetroWest held leads after each of the first three quarters, but a late run pulled Philly out of a 31-23 deficit, and the game went into overtime. 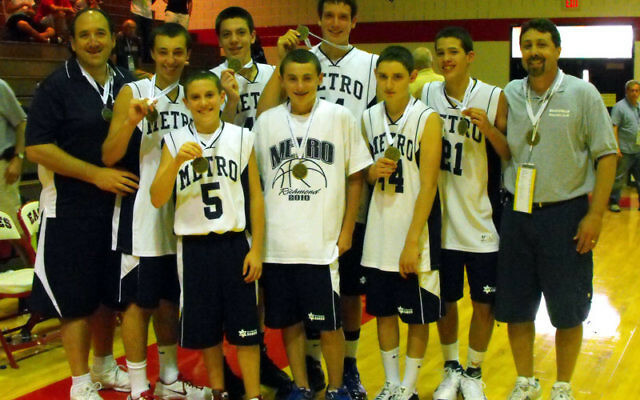 MetroWest captured the gold with a 42-39 victory to complete an undefeated run. The baseball team opened the tournament with a 4-4 tie against the Washington, DC, team, followed by a 6-0 loss to Los Angeles, which eventually won the gold medal. MetroWest crushed host Richmond, 16-0, and Albany, 12-2, leading to a three seed in the single elimination medal round, behind Los Angeles and Philadelphia. In the medal round, MetroWest defeated Mid-Island (Long Island), 13-5, in the quarter-finals. Unfortunately, the team dropped a heartbreaker to Boston, 5-4, in one semi-final while Los Angeles snuck by Albany in the other. MetroWest then defeated Albany, 8-4, for the bronze medal. The athletes competed during the day and in the evenings socialized with their teammates and new friends from around the country. The Games were not only about sports and socializing. All the athletes participated in a Day of Caring and Sharing, a community service project to benefit the local community or an organization in need. The MetroWesters were paired with young children from a local YMCA camp and together wrote cards to soldiers and decorated boxes and filled them with tzedaka items, making care packages for U.S. overseas troops. Another contingent from MetroWest had similar success at the games held in Baltimore. Twenty athletes competed in the 16 and under team in both boys’ basketball and soccer. The soccer squad took home the gold medal while the hoopsters won the silver. Like their Richmond counterparts, the athletes participated in competitions in the morning and afternoon and at night had time to socialize. Some of the evening activities included a dance at the Inner Harbor and a Closing Ceremony party. For information about the 2011 JCC Maccabi Games, contact Sherri Feldscher at sfeldscher@jccmetrowest.org.